dockStubz for Lightning Devices Is Here! The wait is finally over; dockStubz for Lightning devices is here! We’ve worked hard perfecting the design, which features a specially designed male connector, removable height adjuster, and more. So stop taking your case off your iPhone, iPad, or iPod, right now. Head over to our dockStubz product page or watch the video below for more information. 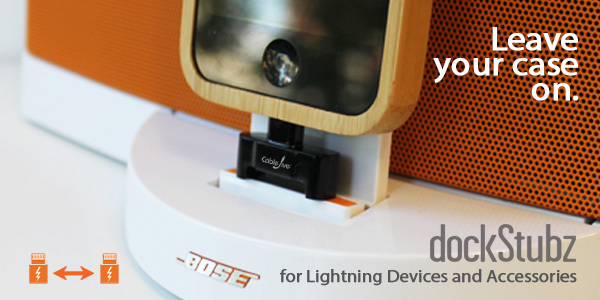 dockStubz for Lightning available right now for $18.95 on the CableJive webstore. The standard length cable that came with your favorite iDevice is always either too short or too long. Never worry about that problem again with CableJive’s new iBoltz Extra Long (2 meter) and Extra Short (12 cm) Lightning charge & sync cables. Perfect lengths for any situation; at home, the office, or on the go. Never sit awkwardly near an outlet or over-clutter your desk with cables again.